I've got at least 3 baking posts queuing up to be published. There seems to be so many activities going on during year-end that I've no time to post about my bakes. With one outing and another and also Shern's antics and also being an TVB drama series addict recently, I'd no time resize and edit my photos. Beginning of December I was crazy over passionfruit. After the successful and most delicious Passionfruit Yogurt Cheesecake, I'd decided to do a milder version of cake using the same ingredients - Passionfruit. And it was really a great choice. This exotic fruit emits a very nice and fresh aroma. My whole kitchen smelled so good while the cake was baking in the oven. As usual, I tweaked the recipe by adding in the pulp and seeds. This is mainly because I was lazy to strain the pulp and also I thought of giving a little crunch to the cake by adding the seeds. 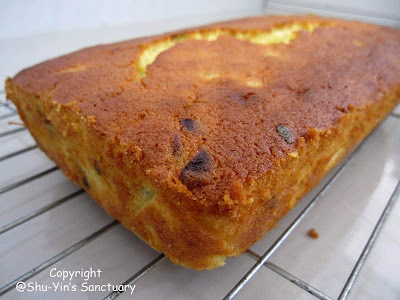 Adding the pulp was a good idea, it gave the cake much more flavour. But I guess I should have omitted the seeds. Don't get me wrong. I love the crunch, but then I took it out when I fed the cake to Shern because I think it must be rather difficult for Shern to bite them and is not so easily digested by toddlers. 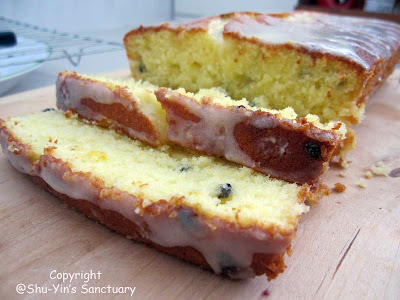 By adding the yogurt, the cake was really moist and soft. 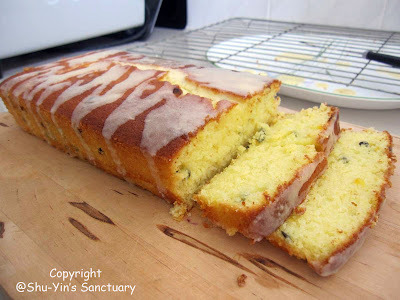 I think it is the softest pound cake recipe I've ever made. I really like it. 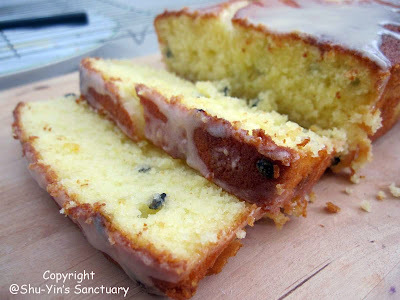 The glaze is rather sweet though, but is a nice contrast to the rather tangy passionfruit cake. You can ommit the glaze if you don't have a sweet tooth. I like it with glaze though because I think I have a very sweet tooth now. 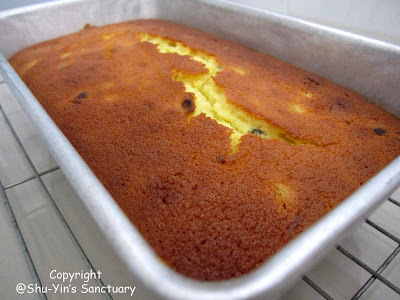 Look at the soft and moist yellow-y cake when cut. Looks so amazing, right? Preheat the oven to 180°C. Butter and line a loaf tin with parchment paper and butter it again. Add in the pulp and seeds here too. To make the glaze, mix all ingredients in a bowl with a whisk. 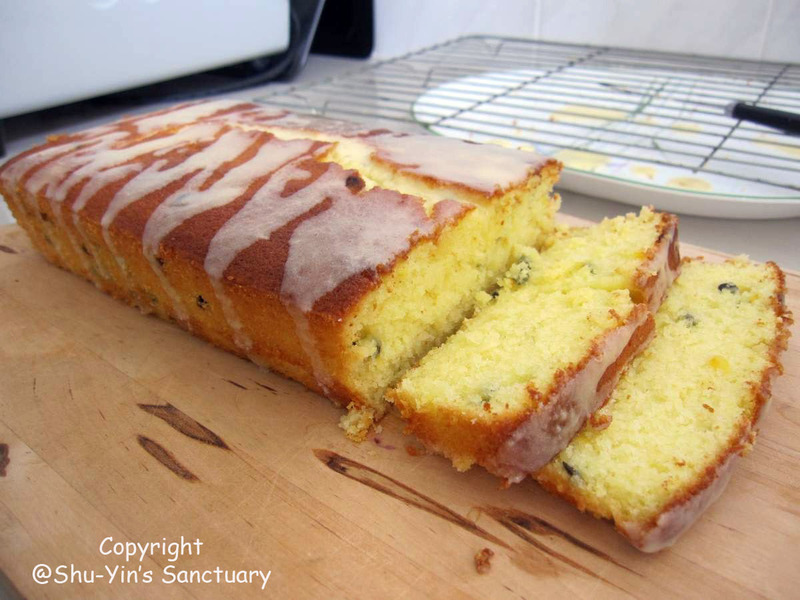 Drizzle the cinnamon glaze over the cake. I looove passionfruit. I've never tried making my own dessert with it but this looks amazing! Absolutely gorgeous cake, I'm drooling just looking at it!